Habit: Shrub, generally hairy, rhizomed. Stem: prostrate to erect, < 5 dm, generally rooting; twigs not or weakly angled, +- green, youngest generally puberulent or glandular. Leaf: deciduous, generally 1--3 cm, generally oblong or obovate to elliptic, generally thin, not membranous, minutely serrate, abaxially generally glandular, base tapered, tip seldom acute. Inflorescence: flowers 1 in axils of lowest leaves of youngest shoots; pedicel not jointed to flower, bractlets 0. Flower: calyx lobes +- 0; corolla < 6 mm, narrowly urn-shaped, +- white to +- pink; anthers awned. Fruit: < 9 mm wide, generally blue-glaucous. Chromosomes: 2n=24. 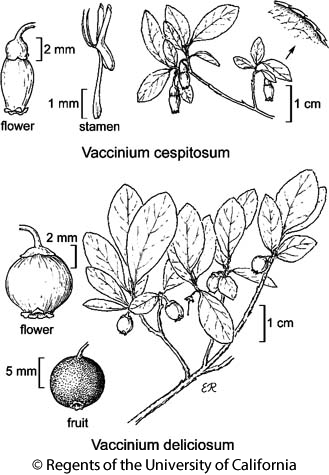 Citation for this treatment: Gary D. Wallace 2017, Vaccinium cespitosum, in Jepson Flora Project (eds.) Jepson eFlora, Revision 5, http://ucjeps.berkeley.edu/eflora/eflora_display.php?tid=47650, accessed on April 23, 2019. NW (exc NCoRI), CaRH, SNH, CCo, SnFrB, Wrn; Markers link to CCH specimen records. Yellow markers indicate records that may provide evidence for eFlora range revision or may have georeferencing or identification issues. Purple markers indicate specimens collected from a garden, greenhouse, or other non-wild location.